Less is More challenge #386 has the theme of Water. I am lucky enough to live by the water - walking distance to the local beach - though I don't often actually swim. The water always seems too cool for me, as we live in Victoria and our beach is one of the beaches around Port Phillip Bay. 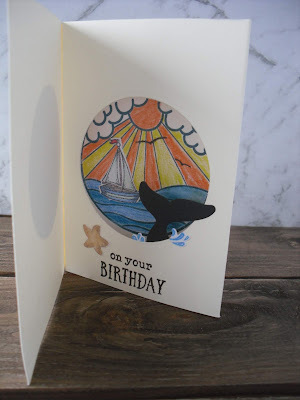 However, I love to see the sea, so here is my card for this challenge. 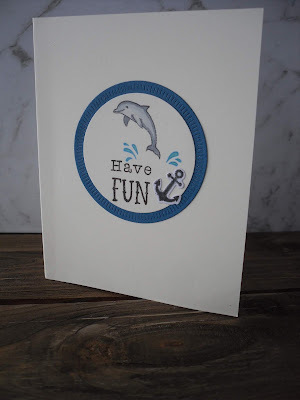 I went to the trouble of masking the oval on my stamped layer, then decided I would prefer it to be revealed through a top layer with the oval cut out - either way, the water is the feature, achieved with a stamp that looks so realistic! Hello friends! 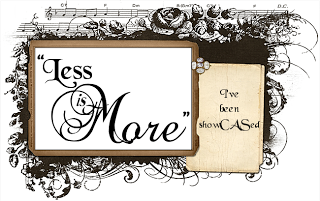 A new year and a resolution (of sorts) which is to post more often, on projects that really interest me! 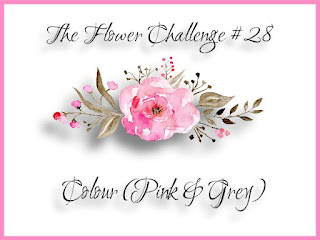 The Flower Challenge caught my eye this week, so this is the first one of the year for me. 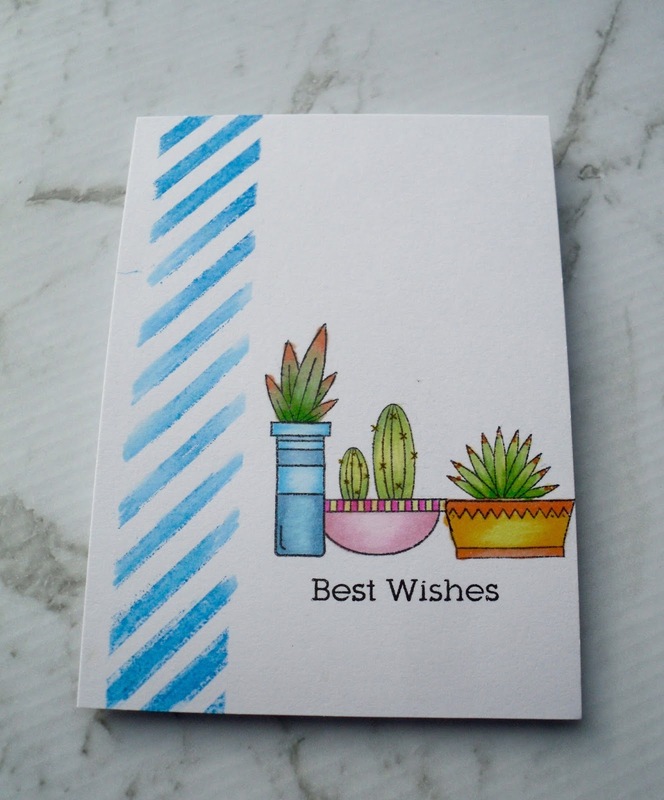 Method: Apply ink to clear block, spritz with water and apply to card front. A lovely one to start the year - I only hope I can keep going with my good intentions! 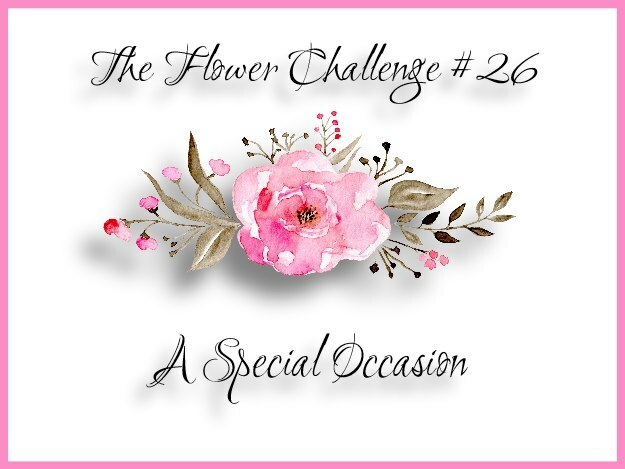 I've grabbed a little time for myself to join in the challenge over at the Flower Challenge, where the theme is 'A Special Occasion'. 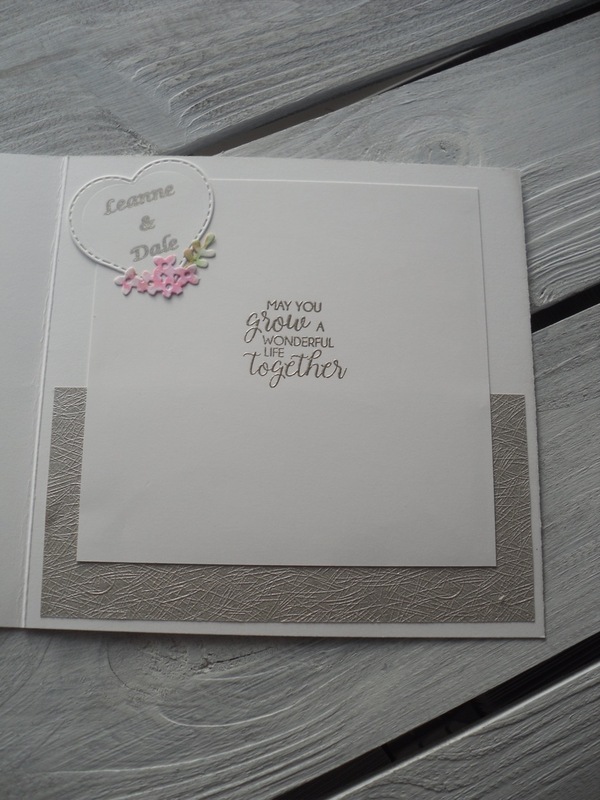 The special occasion was a wedding for a friend's grand-daughter, and inside the card I added the names of the happy couple. 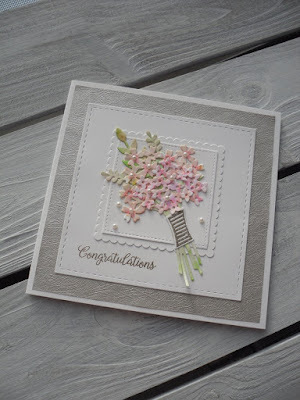 Stamp set and die bundle used: Beautiful Bouquet by Stampin' Up! Thanks for taking a look - hope you like it! This bundle has been my favourite purchase this year! 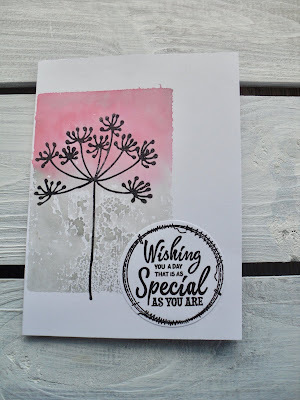 I've just noticed the challenge at Power Poppy Stamps for August calls for inspiration from home - so this is what I came up with! 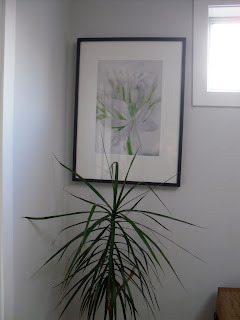 I took inspiration from this subtle photo print, which hangs in the corner of our dining area. It was given to me one Christmas by my son and daughter-in-law - I love its clean style and so I knew straight away what Power Poppy stamp I could use - the digi stamp Kindness. 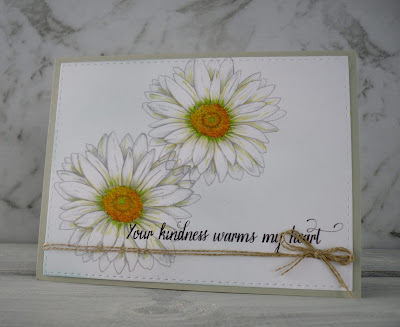 I am fairly new to customising digi stamps but I was thrilled that I was able to move one bloom closer to the other without cutting off a corner! I didn't manage to put one in front of the other, but I think I could next time - baby steps! 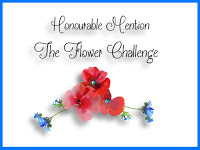 I did however bring the sentiment up over one flower! Anyway, I'm very happy with how this first attempt turned out and will experiment further to see what magic I can do. I have been a fan of Power Poppy for some time, and always enjoy colouring Marcella's images - they are beautiful. Entering this card into the Less is More Challenge #376 - a one layer card with the theme of Stripes. 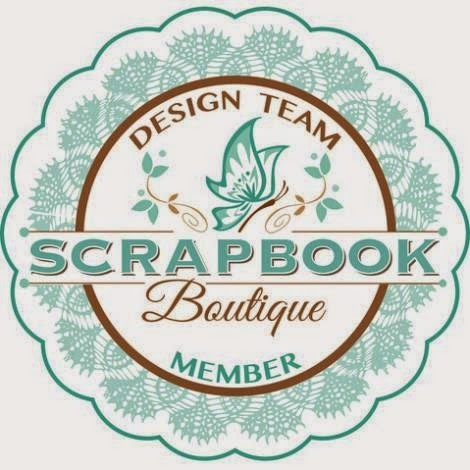 Welcome once again to Scrapbook Boutique's monthly challenge and blog hop. 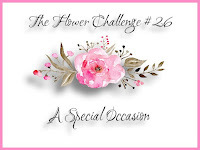 You should have arrived here from Angela's amazing blog but if you didn't and want to start at the beginning, just click on the SBB blog link above and start again! 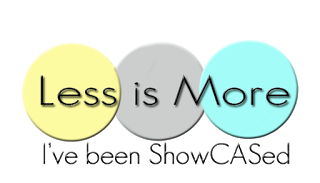 We'd love you to join in with us this month! There are two ways you can do this - you can comment on each blog in the hop, ending with the SBB blog, or you can create a project (either a card, scrapbook layout or off the page project) inspired by this moodboard. 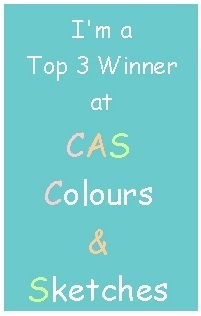 Of course you can do both for a chance to win both prizes! 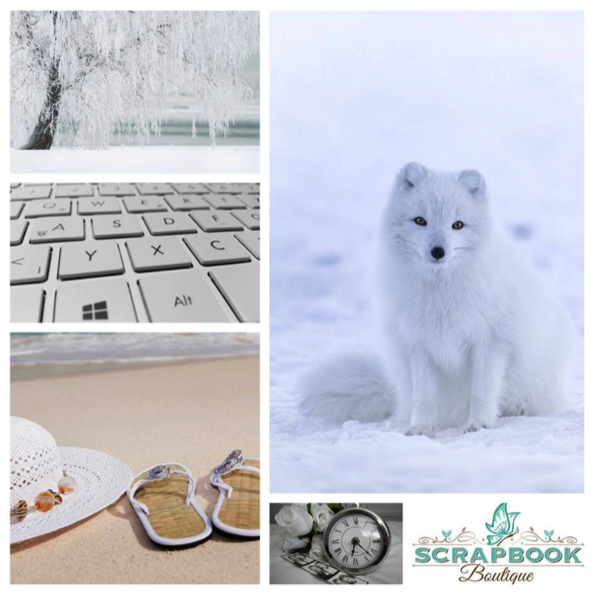 Please check out the rules of entry, and the prizes at the Scrapbook Boutique Blog and note that this challenge is open to Australian and New Zealand residents. From the moodboard, I was inspired by the wintry tree in the top left and the keyboard letters, and chose to make an early Christmas card in white tones, but with touches of pink and blue as in the inspiration pic. 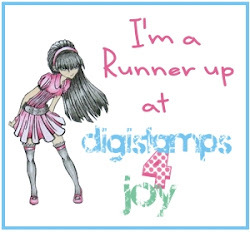 I've also used a little die I've owned for ages, which gave me the tiny tiles for my letters - it is called Clever Typepad and is by Poppystamps. The letters are rub ons from my stash. My background uses the holly branch by Kaisercraft Merry Christmas stamp and die set, which I've white heat embossed and sponged with the palest blue and pink. I stamped another holly branch onto vellum, and fussy cut it out, to add to my banner. 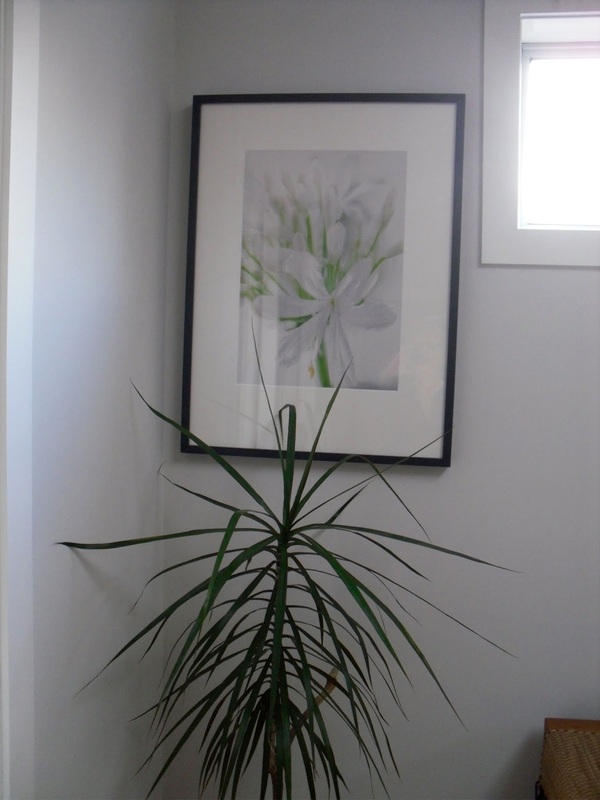 The square frame adds a bit of 'fancy' but any square die or simply cut the panel to size would be fine. My card base is a 14cm square card in pale grey. 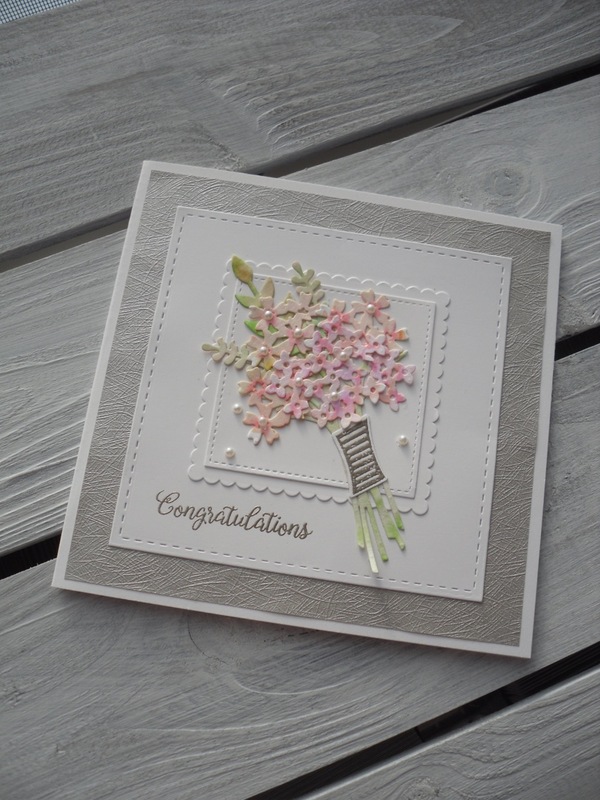 Now you should hop on over to Linda's blog to find out what she has created to inspire you! I'm sharing this new style of card, but probably shouldn't! 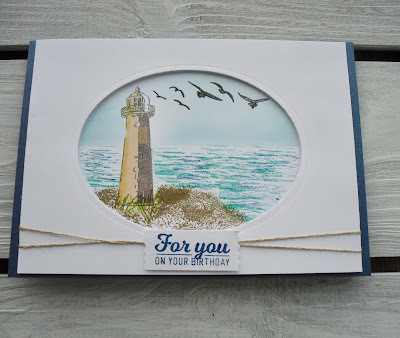 I've followed Jennifer McGuire's tutorial for an inside box card, using a fun stamp set given with Papercraft Essentials Issue 160. I loved the stamps, and the dolphins, as I live beside Port Phillip Bay, where we often see dolphins playing - especially when crossing to the other side of the bay. then on the inside there is a whole scene, including a frolicking dolphin. My photo doesn't show it well, as I don't have many layers (I'll try that next time) but it is a little different and quite effective. My blog friend Pri (who creates the most colourful cards) of Me and My Daily Papercraft has made a top fold 3D box card, and it is super - check it out here! I'm only sharing mine because I hope to improve!